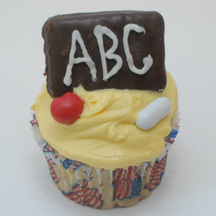 These cupcakes are a slight variation of back to school cupcakes recently shown in Family Fun magazine. The chalkboard is chocolate-covered graham cracker! I’m thinking of making a batch for my son’s preschool potluck. Instead of ABC you could write students’ names, school name, etc. What You Need: 1 cupcake; frosting tinted yellow; chocolate-covered graham cracker (we used Keebler); white Good ‘n Plenty candy or Tic Tac; small red candy for apple (we used Runts); white writing icing in tube or pastry bag. This entry was posted on Sunday, September 7th, 2008 at 10:36 am	and is filed under career cupcakes, graduation cupcakes. You can follow any responses to this entry through the RSS 2.0 feed. Responses are currently closed, but you can trackback from your own site.